For many people – certainly anyone under 40 – it feels like AIDS has been around forever. With the spread of the disease around the world, the media focus has actually dimmed. Rarely do you hear of celebrities dying of AIDS. With the development of the so-called AIDS “cocktail” of drugs, those infected can live much longer, healthier lives than anyone could’ve predicted 30 years ago. On July 3, 1981, a story appeared in the New York Times on Kaposi’s Sarcoma, a rare cancer affecting gay men. It is on that day that the film Longtime Companion opens. 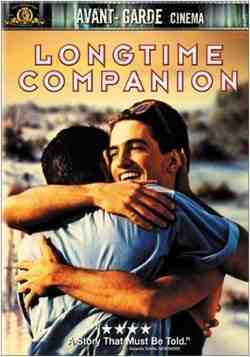 The first feature-length film addressing the AIDS epidemic, Longtime Companion follows a group of friends through the 80’s. We see the denial, the ignorance, the fear, the randomness of infection, through the eyes of people who were most affected. The grief at times is overwhelming. The story is told through a series of vignettes, alternating between New York City and Fire Island, as the group of friends slowly grows smaller. We learn the various names given to the puzzling and frightening afflictions: gay cancer, gay plague, and the official “Gay Related Immune Disorder”, or GRID. It is a painful film to watch, but the deathbed scene where Bruce Davison urges his partner, Mark Lamos, to let go, was certainly what earned him an Academy Award nomination. It’s worth renting it just for those few minutes. There are several excellent films that address AIDS: Philadelphia, And the Band Played On, Peter’s Friends, At Home at the End of the World. We’ll look at all of them and others over the coming months, as we commemorate 30 year of AIDS. Thanks for your kind words, Jamie. The movie is really wonderful. I've never watched the HBO-version of "And The Band Played On" all the way through, just a scene here and there: too painful. I've read the book, but I'd get mad and throw it across the room! Hope you'll come back soon!